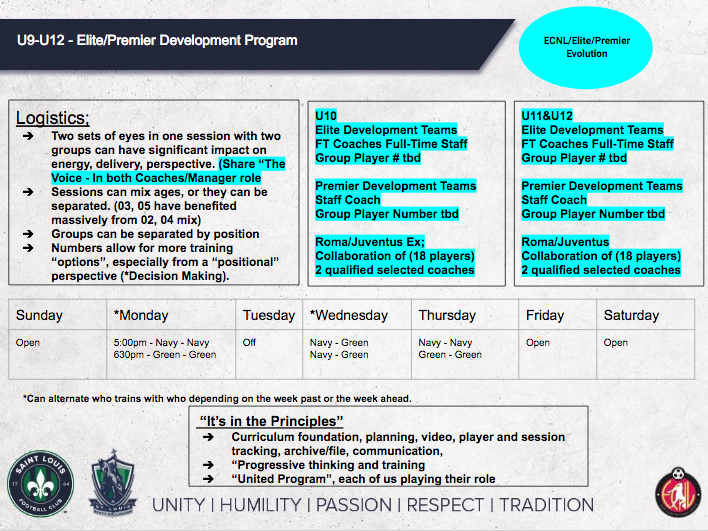 Elite & Premier Development Programming - "Collaborations"
The MO Girls Division is adjusting the structure of younger age groups in an effort to encourage and promote more "collaboration" between teams. SLSG, over the past several years, has been doing a lot of experimenting with "group training". The "group" set up has been beneficial to player experience for several reasons including the guarantee of higher numbers at training sessions which have allowed for different types of training setups. Also, teams and coaches working together in a single training session has increased competition amongst players of similar playing level and age, and in addition, it has allowed for two or more coaches to be on sight, adding energy, a different perspective, and different voices to stimulate learning. 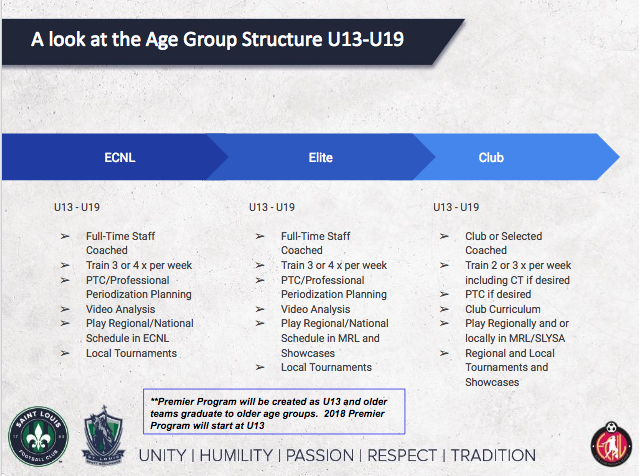 Next season, at the younger ages, we will be encouraging "collaboration" of groups regardless of level but specifically with the introduction of the Elite and Premier Development Programs. 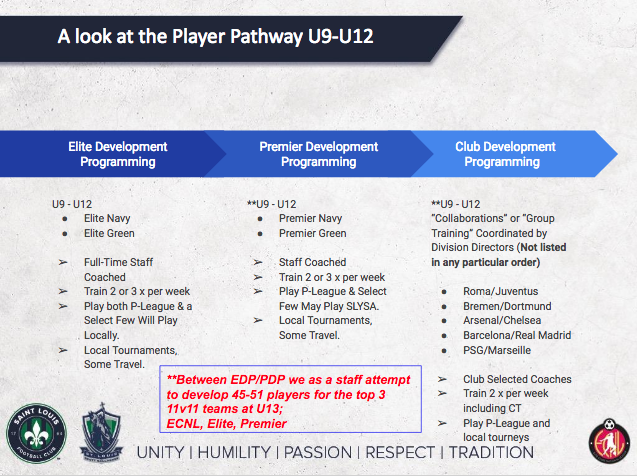 The Elite and Premier Development Programs will begin at the U9 age group and continue on through the U12 age group until teams graduate to a 11v11 format and into the ECNL, Elite, Premier, and other such platforms. Within these programs, for example, the Elite Program will have a larger group or "collaboration" training together rather than a single team. So as early as U9 the club will have a U9 Elite Navy and Green as well as a U9 Premier Navy and Green (Some age groups such as U9 may not have the number of players needed to fill these places so there may only be a Navy or Premier may be created throughout the season). But the "collaboration" will be encouraged deeper into the age group as Division Directors pair up teams and coaches they feel can work well together to benefit both coach and player experience at team training, club training, and competition calendar. Division Directors will begin discussing collaborative possibilities with coaches throughout the Placement Process. The "Club Level" is playing level where the majority of our youth boys and girls enjoy this game. Even inside the Club Level there is a wide range of playing abilities and competition calendars. Players choose to play in the Club Level for many reasons including wanting to play for a specific club coach, or with close friends, or because the competition and training calendar fits best with other extra curricular activites an student athlete may have in their daily lives. Club Level teams, for the most part, practice twice a week, and compete in local leagues and tournaments. These groups also participate in Club and Technical Training on a weekly basis as well as have opportunities in SLSG Soccer School and Player Development Training.